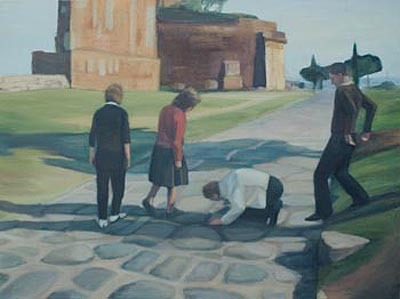 Karin Hanssen, from top: The Secret, 2007, oil on canvas, 65 x 40 cm coll. 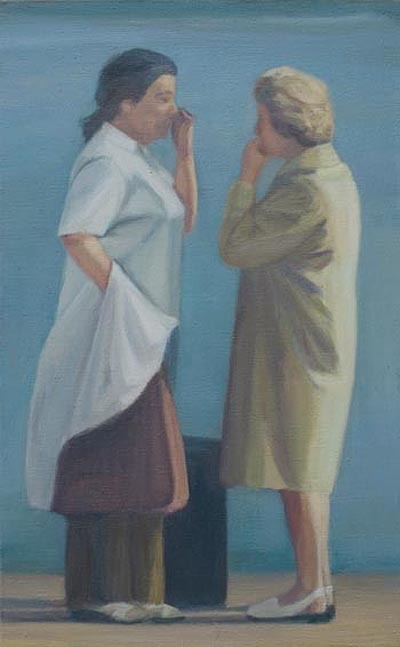 NBB; As You Like It, 2007, oil on canvas, 75 x 100 cm, priv. coll. 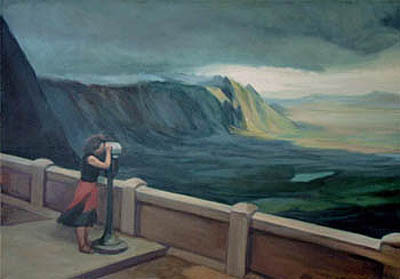 Karin Hanssen, Timestructures, from top: View, 2005, oil on canvas, 100 cm x 70 cm, coll. 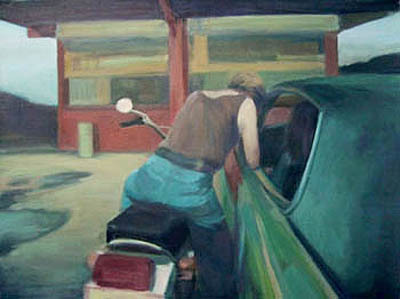 UBS; Honda, 2005, oil on canvas,80 cm x 60 cm, priv. coll. 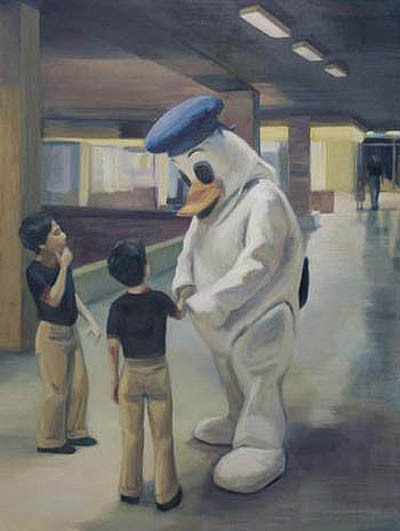 Karin Hanssen, The Thrill of Ot All, oil on canvas, priv. coll. 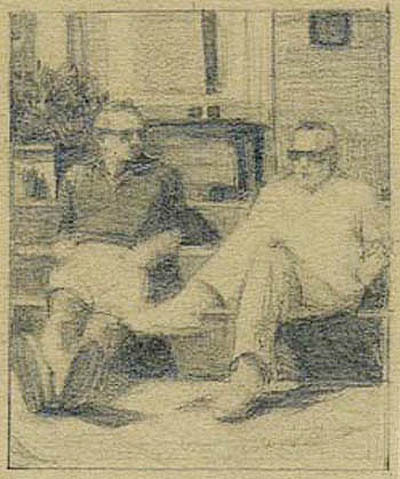 Karin Hanssen lives and works in Antwerp. She is highly regarded as one of the enduring female painters who emerged in the early Nineties as part of the new Flemish painting scene. 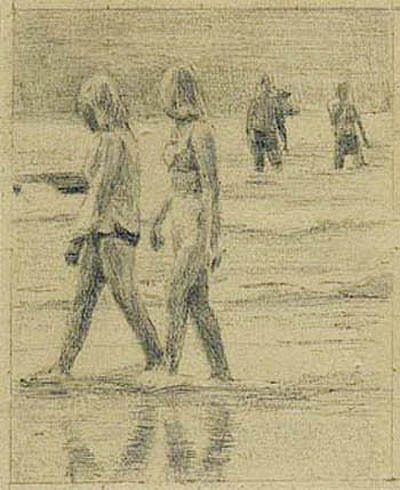 Hanssen's paintings and drawings are replete with meticulously constructed layers of philosophical and pictorial meanings, and reward prolonged looking. She incessantly explores the concepts of temporal disorientation, social semiotics, feminism, the 'Rückenfigur' and 'The Borrowed Gaze'. For the past two decades Hanssen has worked in series. 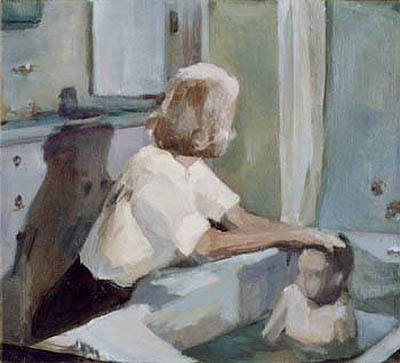 Her clearly defined cycles of work consistently expand her temporal, spatial and gendered constructions. She maintains her unique painting style throughout. 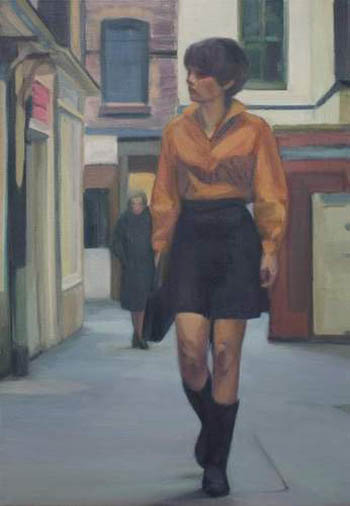 Her paradigmatic portraits and scenarios - painted in hazy colours - are embedded in deterministc environments, ranging from domestic interiors to holiday landscapes derived from Fifties' and Sixties' magazine photography. 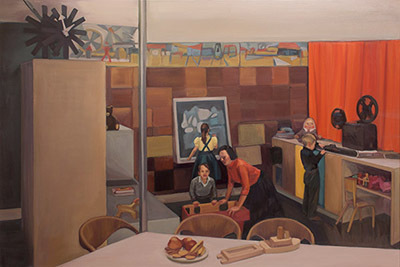 Hanssen's evolution began with the painting cycle I have a Dream (1994-1995) a series of paintings and the drawing series Die Gebildeten on stereotypical photographical representation of class and gender, which was followed by theThe Thrill of it All(1995-98) with its focues of social determinism of women and the use flashback as a device and her acclaimed series of drawings Modern Living(1995-2001), followed by Scenes(1998-2001) and Timestructures, which introduces the freeze-frame and close-up as methods to merge past and present in a critical examination of modernity. The cycles As You Like It(2004-2007), inspired by Shakespeare's gender ambiguous comedy, ABC,123 (2005-2008), which opens up a global gaze and introduces close-ups of interiors and Now=The Time (2009-10) continue the cyclical explorations. The Borrowed Gaze (2010-11), a reappropriation of the famous work Paternal Admonition (1654) of Gerard ter Borch, presents a departure with its conceptual examination of the averted female figure in 17th centruy genre painting and programmatically re-introduces the live issue of the role of female artists in the contemporary Belgian artscene. 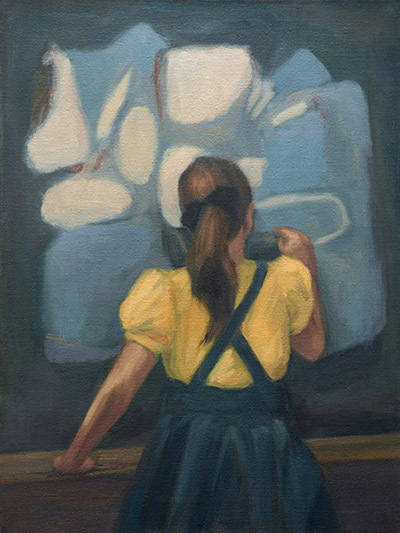 Hanssen's most recent series of works A Room of One’s Own (2011-14) is named after the 1929 classic essay by Virginia Woolf in which the writer looked at the position of female writers in the then male-dominated world of literature. Hanssen's work critically examines the complacent acceptance of modernity by confidently exposing some of its faultlines.